At least, that’s the hope, right? 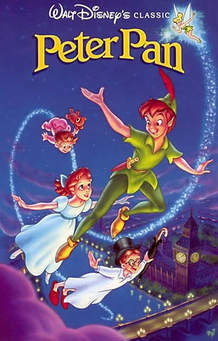 When I watch Peter Pan, that sentiment is how I connect. He never grows old; never loses his sense of wonder for the world. I feel that connection to him, because everywhere I go, even if the place isn’t as wondrous as Neverland, I find something “sparkly” about it. I make something “sparkly” of my environment. I never liked Wendy because I thought she acted like a little old lady. Sure, you’d want to come back to your mom and dad (uh, maybe, I’d really be tempted to stay in Neverland! ), but did she have to be such a fussbudget? A little old woman in a little girl’s body? But you know people like that, don’t you? No matter the age, they’re old. Responsibility over spark. Vegetables before desert. Are we a mixture of both? I think my daughter is. She’d probably say I’m too much Peter, not enough Wendy. How about you? Are you more Peter than Wendy? Would you stay in Neverland? Are there ways we can hold on to our inner youth? Oil of Olay is fine, but how do you keep your inner child from drying up like a prune?